David and I decided to take a mini vacation very close to our home because we are currently working on saving up for a wedding. 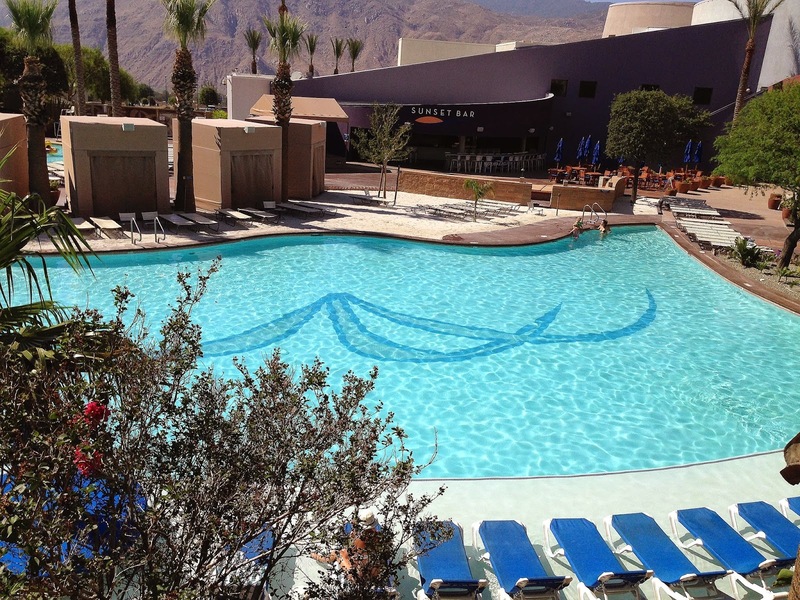 This is why Morongo Casino Resort & Spa was the perfect place to go. It was about an hours drive and very inexpensive. We chose to check in on a Sunday and checkout on Wednesday for a 3 night stay, the approximate total was $450.00. I made a specific request to my fiancé, we must be there when its over 85 degrees so we can take advantage of the amazing pool area. What better time to go than June! We left pretty early on Sunday morning so we could scope out the Cabazon Premium Outlets. What kind of trip would it be if I didn't get to shop a little?!?! Most of the shops had regular prices which was pretty disappointing because I love getting great deals especially if I'm at an outlet. I did find some hidden gems to share with all of you. The first store I stumbled upon with amazing deals was the Kate Spade store where everything was 40% off plus an extra 20% off handbags, wallets, and clothing. The second store was the Coach store which had a huge clearance section where handbags and wallets were an extra 50% off already reduced prices. This is where I bought my mom a beautiful Coach purse for $100.00, original price $378.00. Happy birthday mom!!! The last store that tempted me tremendously was the Gucci store. There was this one specific bag I had been looking at for a few years now and they had it for $680, current price online is $990. It's not a steal but its $300 off for Gucci which is a steal for me! Sad to report I did not buy the bag because we took this vacation to save not to spend on luxury items we don't need. After the fun detour we finally made it to our destination! We arrived around 1pm and to our surprise there was no line at the check in counter. Like true alcoholics, the first thing we did was hit up the pool with some much needed drinks in hand (j/k not alcoholic's just eager vacationers). We setup up shop right next to the lazy river because it's the best lazy river I've ever been in! The current really takes you around the world and back in 2 seconds, by the world I mean the jacuzzi and water slide which to me is the world when I'm on vacation. After our around the world trip we had built up quite an appetite so we order some treats from the pool bar. I had the best chicken tenders with criss cut fries and loads of ranch while my future hubby had some sliders. I was so beat I couldn't hang for dinner, instead this little fishy took a nap because I had my "I can do what I want I'm on vacation" mentality! I did have a very hearty breakfast at the Serrano Cafe before we did our thing at the pool. My hubby and I enjoyed a delicious dinner at the Potrero Canyon Buffet and it was Mariachi Monday which meant I could eat all the Mexican food my heart desired while listening to the Mariachi Divas. I did gamble a little bit on the machines but it was not my lucky night, on the other hand David won over $150 playing poker, black jack, and the machines. All in all it was a great getaway and I would definitely go back to Morongo. Hope everyone enjoyed my first lifestyle/travel post. If you have any questions or suggestions please let me know in the comments below. Thanks for stopping by Diana!! I'm craving to go there) very nice photos and I like your sunglasses very much! Thank you Solya, I'm so happy you enjoyed today's post! !